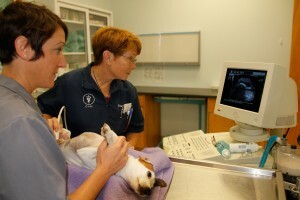 The State Street Animal Hospital, PC offers both x-ray and ultrasound exams. X-rays are taken after the findings of a thorough physical exam indicate they are needed. Fractured bones, arthritis, bladder stones, and pneumonia are just a few of the many diseases we can diagnose with x-rays. We also have ultrasound available for abdominal exams. Ultrasound uses sound waves to look at soft tissues. It is non-invasive, painless, and has no side effects. With this we can diagnose many problems that are otherwise invisible. For example, intestinal foreign bodies that do not show up on x-ray, various forms of adrenal disease, and many cancers can be seen.